Nothing says Valentine’s Day like wine, chocolate and live romantic music! 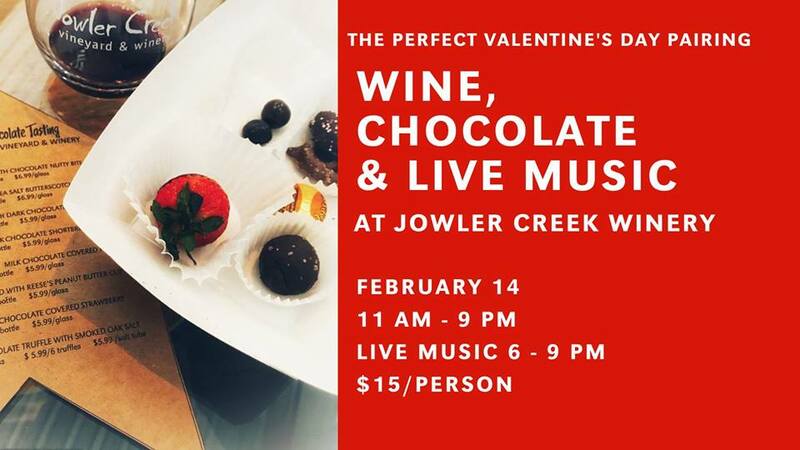 For just $15 (or FREE for 2-Bottle Creek Club members) you can pair five of Jowler Creek’s wines with piece of exquisite dark and milk chocolate, truffles, heart-shaped cake bites and other decadent chocolate desserts designed to pair perfectly for each wine. We’ll also have live acoustic music playing this evening, so come on out and relax and un-wine’d on this romantic day at the winery. This $15 cost includes a FREE wine glass to take home as a souvenir.